Laquerlicious Halloween Collection - Polish Etc. It's October! 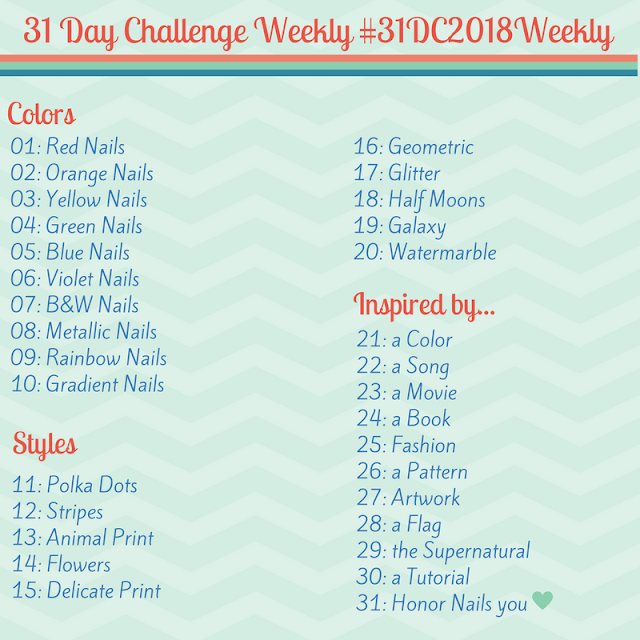 Time for some Halloween themed polishes! 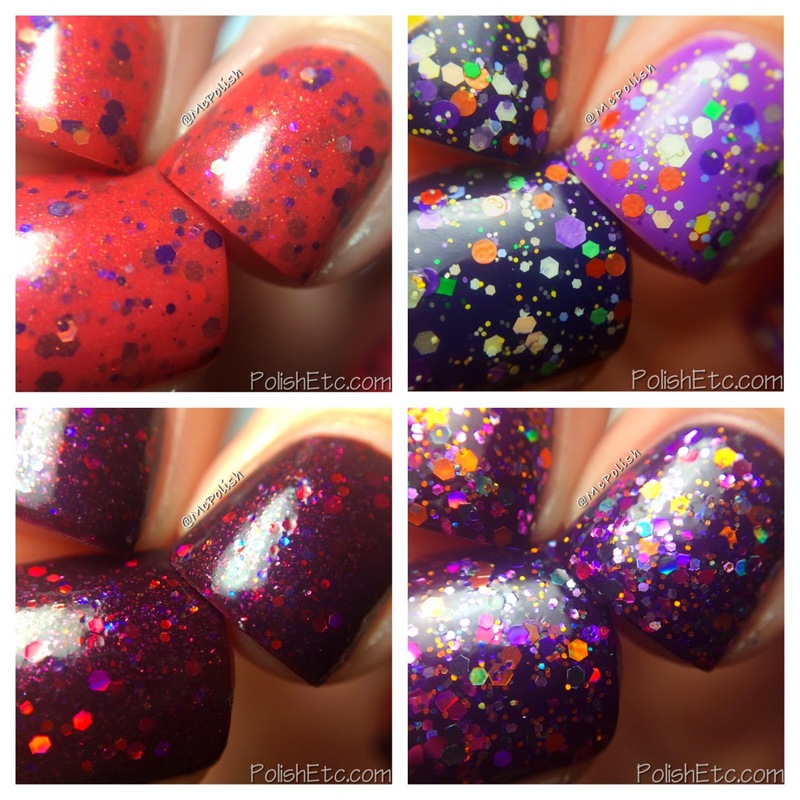 Today I have swatches of a small Halloween collection from Laquerlicious to share with you all. This four pack of holiday awesome consists of two glitter toppers and two crelly/glitter polishes. Halloween is one of my favorite holidays and this collection really captures its playfulness. Let's get into some swatches! Let's start with the glitter toppers. First up is "The Ghostess with the Mostess" which is a glitter bomb in a clear base. Michelle makes some pretty great glitter bombs and this one is no exception. This is a combination of matte hexes, stars, dots and triangles in a rainbow of colors. I used one coat over Tillie Polish "Lodge at the Lake" and Wet-n-Wild "Who is UltraViolet?" Next up is "Witchful Thinking" and it is awesome. This is my favorite of the collection, not only because of the clever name but also because it is the perfect combo of orange and purple and metallic glitters. I used one coat over China Glaze "Crimson" and three coats alone on my ring finger. I just couldn't pass up a chance to mattify this glitter. Holy Moly!! Now onto the opaque polishes. "Vamp Tramp"is a shimmer laden wine colored crelly base with red and purple glitters. Some of the glitters are holographic and really pop in the burgundy base. I used two coats for this swatch. Lastly is "Tomb It May Concern", a orangey-brick colored shimmer with deep blurple and gold glitters. I really like the color of this base and the shimmer is intense. Its a great polish! I used two coats with top coat for this swatch. So what do you think about this little collection? Orange and purple are such great Halloween colors and I feel this quad showcases them brilliantly. Today is the day to get this collection! Head over to the Laquerlicious shop at 2pm PST to grab you some goodies. Thank you Amy! Beautiful as always! I love The Ghostess with the Mostess mattified! I haven't tried it matte yet! I will check it out. Those two were my faves as well! Actually whole Halloween collection looks fantastic, sparkly, shiny and wonderful for autumn.